Lori here with this Tea-riffic Card!! 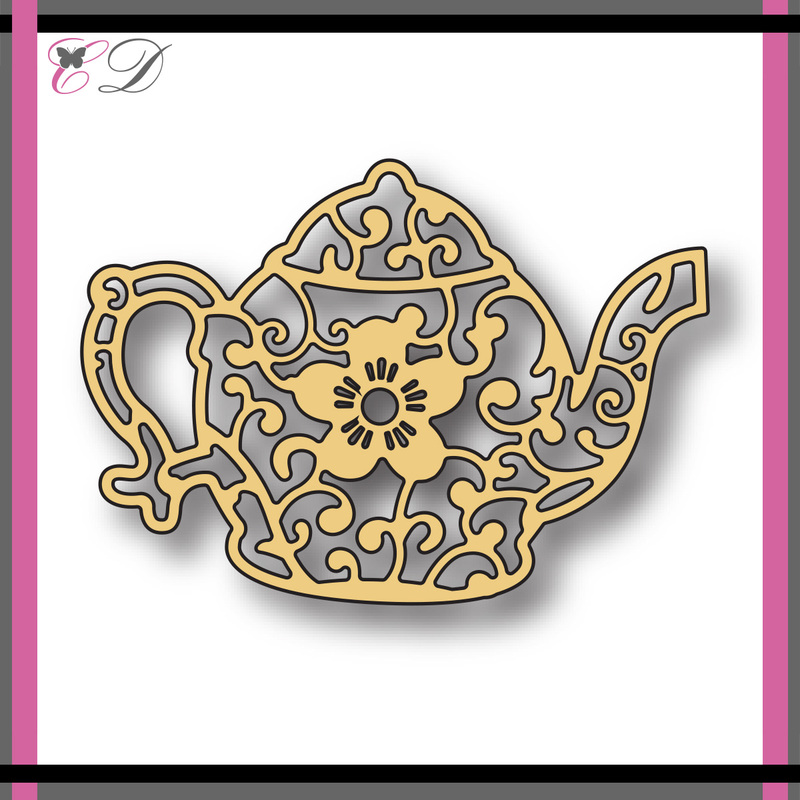 I used the Teapot die from the exclusive line of Cheapo Dies. For this A2 card I die cut the Teapot die twice, once in white paper and once in blue paper, I attached the blue teapot to the yellow paper and then inlaid the white pieces in the teapot. I took a wink of stella pen and brushed some glitter onto the flower. I took a white pearl and placed it in the center of the flower. I distressed the edges of the yellow paper and then mounted that on some more blue paper. I took some Faded Jeans distress ink and inked the edges of the rectangle. I took some white card stock and made the base of the card. I took the yellow and white patterned paper and inked the edges with Faded Jeans distress ink and then added that to the card. 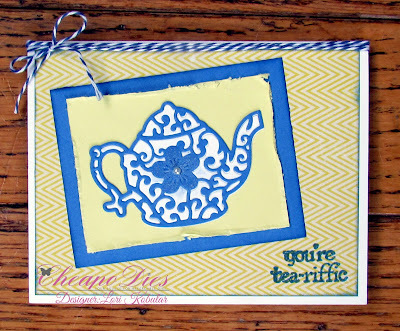 I took the blue paper with the teapot on it and placed it onto the card at an angle. Then I took the you're tea-riffic sentiment and stamped that onto the bottom right hand side of the card with Faded Jeans distress ink. I took some blue and white bakers twine and wrapped that around the card several times and then tied it into a bow. I love the delicate design on this beautiful die! Be sure to head on over to the Cheapo Dies store to see all the lovely dies there are! Stop by the blog often to get some inspiration on how to use your dies! 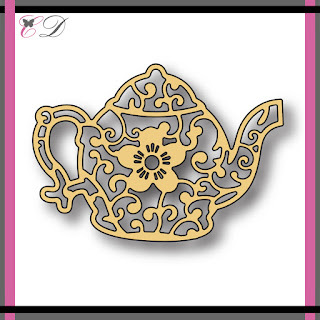 Fabulous teapot card and all the inlaid pieces really set it off!! I love the way you used the teapot. That is one of the dies I had to purchase too. I thought it so gorgeous and it will work so well for a simple card design. Using the inlaid pieces really makes it awesome! 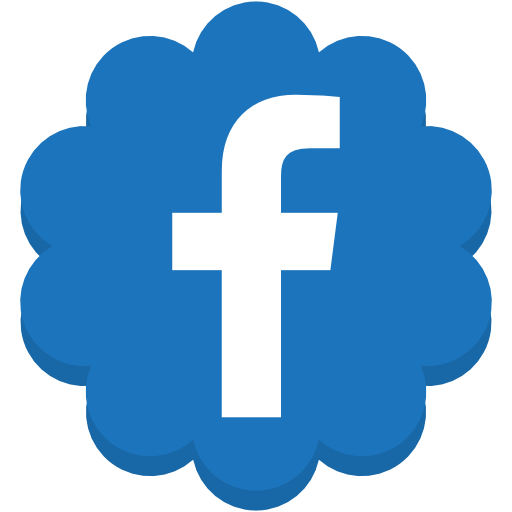 Thank you Verna! I love anything teapots and teacups! !